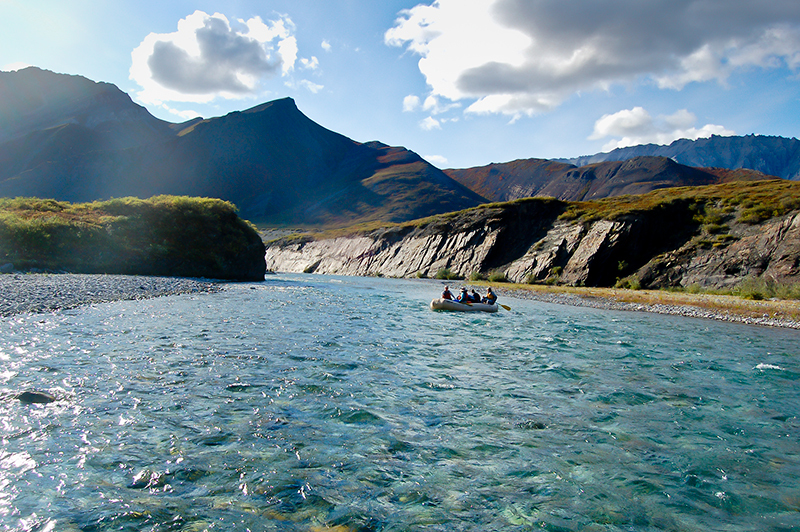 Paddling the Marsh Fork and Main Fork of the Canning River through Alaska’s Arctic National Wildlife Refuge and Preserve is truly a trip of a lifetime. 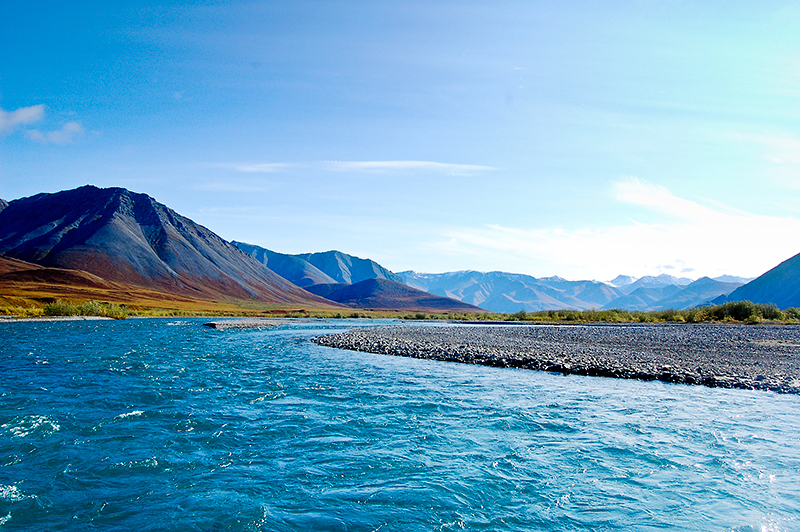 This river is an unusually spectacular gem of Alaska's North Slope. 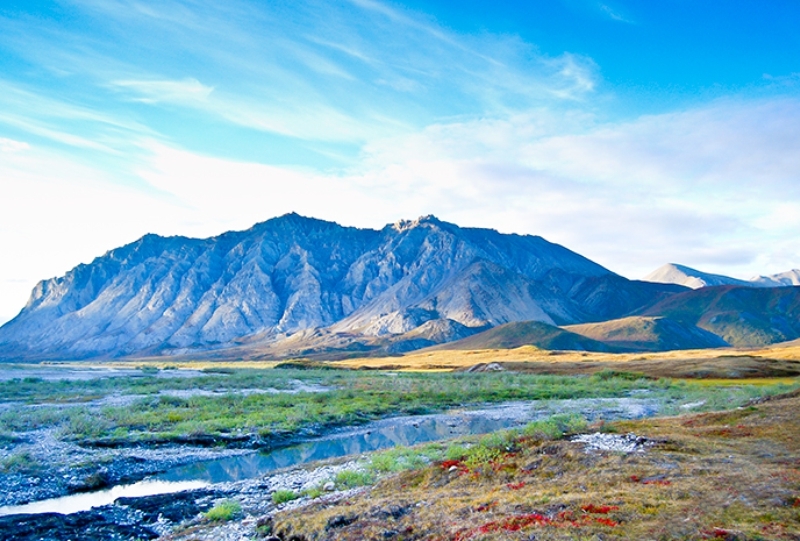 The Canning lies on the western boundary of the Arctic National Wildlife Refuge (ANWR) and meanders through the Franklin, Philip Smith, Shublik and Sadlerochit Mountains of the Brooks Range, out on the coastal plain and to the Beaufort Sea. We wind in a serpentine fashion down a river of turquoise and green hues surrounded by a dramatic landscape of multi-hued tundra plants. 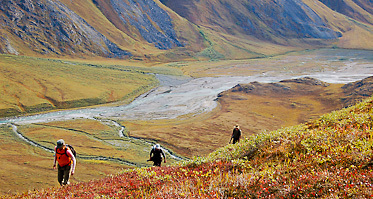 As we descend through this magical landscape, we will take additional time (layovers) for hiking, fishing for Arctic grayling and char, nature and wildlife photography. 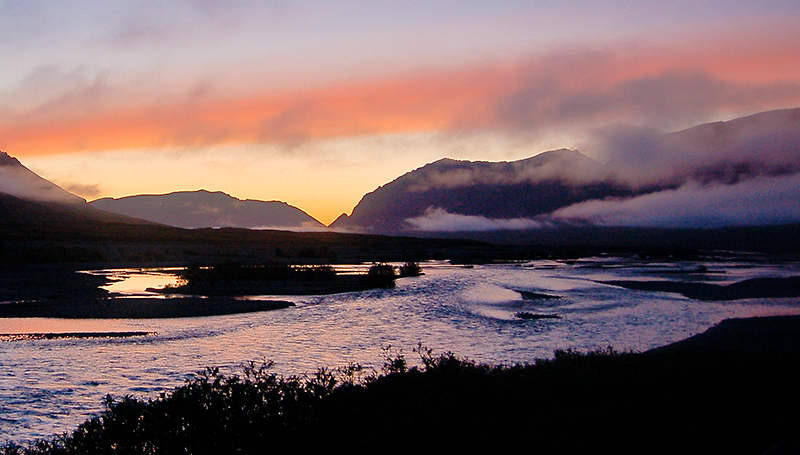 Our group will enter the ANWR during one of its finest hours. 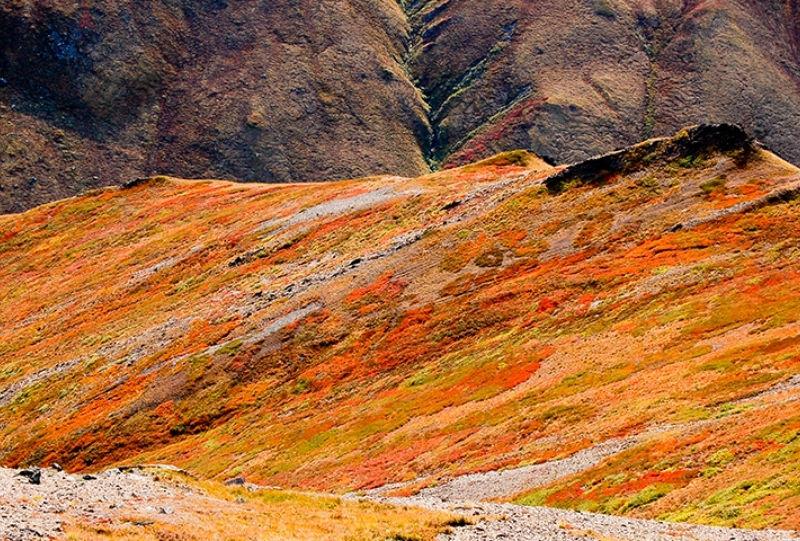 The first frosts of fall have eradicated the mosquito population and by mid-August, the tundra is beginning to show its autumnal brilliance. Arctic blueberries, low bush cranberry, dwarf birch, and sedges become a spellbinding mosaic of colors. Our itinerary enables us to select prime areas for viewing wildlife and with good fortune we'll be able to observe and photograph the resident animal and birdlife. 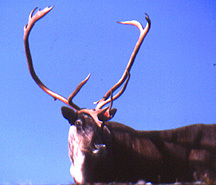 small caribou bands migrate across the river, Barren Land Grizzlies waddle over the landscape, Dall sheep graze on distant hillsides, Musk Ox forage on sedges, Arctic foxes dart around our kitchen, wolves relentlessly stalk their prey, golden eagles, gyrfalcons, merlins, short-eared owls, and harriers cover the aerial environs above us. Nowhere else on the North American continent do polar bears cross scent lines with wolverines and wolves and grizzlies, and moose browse on willow trees, as herds of caribou sift through. "Swamped by Beauty and Swallowed by Space"
Whitewater; For Novices and Seasoned Boaters; 6-7 days of rafting and approx. 2-3 layover days for hiking. 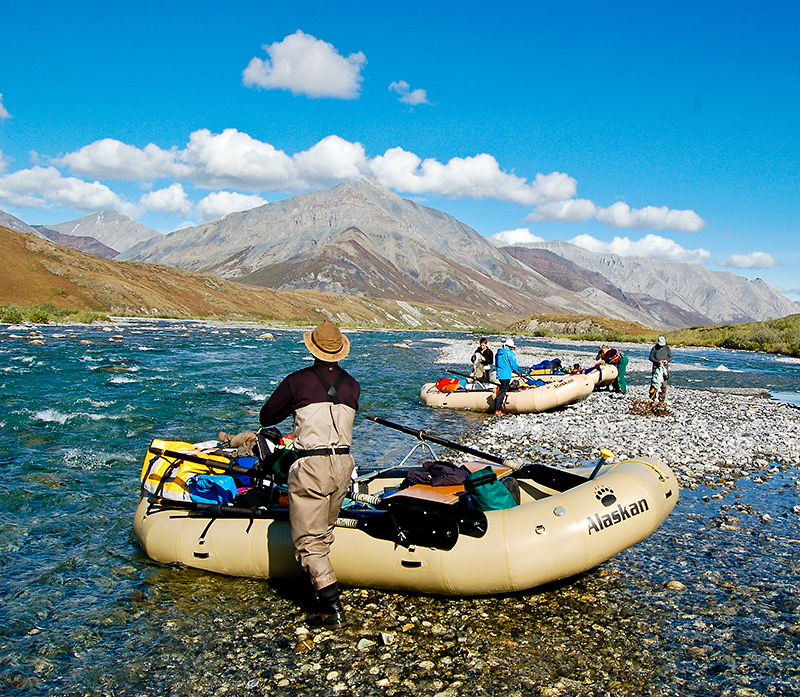 Paddlerafts with gear only, optional easy-moderate hiking, low elevations, variable climate, tent camping. Individuals are welcome from age 16 up. 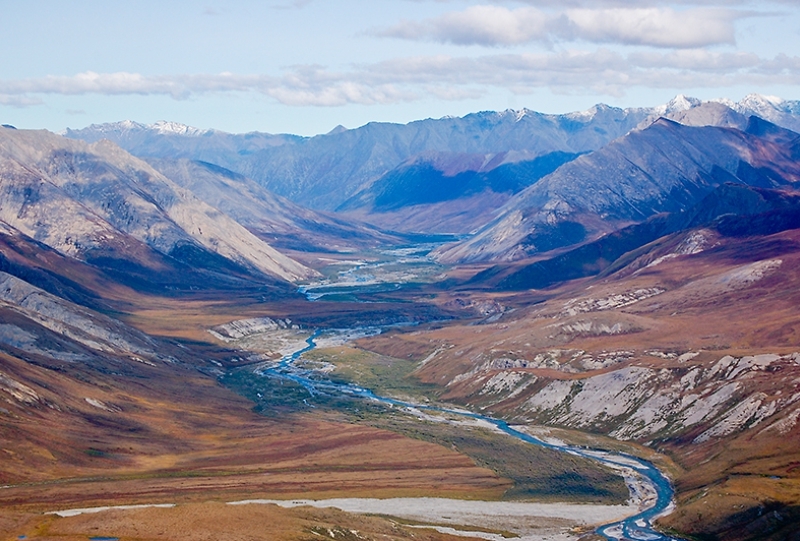 Our trip begins with a 300-mile flight across the tundra, ponds, and the Yukon River Flats to the Gwich’in Native settlement of Arctic Village. 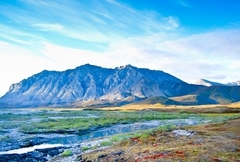 We then transfer to our bush planes and fly over the Eastern Brooks Range to the upper reaches of the Marsh Fork of the Canning. As we enter the Canning drainage by wheel-plane, a carpet of tundra spreads before us like a mirage in the late summer-autumn of mid August. Nature's cycles of the day, year, and century seem undisturbed. The days are sixteen hours long, and the sun takes four hours to set. Meanwhile, it casts a brilliant gold on the willows, and makes a low, horseshoe curve above the horizon. The tundra, with its sedge tussocks, reindeer moss, low-bush cranberries, lichens, dwarf birch, and net leaf willow, is a miniature Japanese garden growing on thin soils above the permafrost. Implacable, raw, elemental, beautiful, and remote from human influence this region is host every summer to the calving and migration of 175,000 caribou from the Porcupine herd. Each year, this enormous herd travels from the more protected forested areas to the south, northward to their traditional calving grounds along the coastal plains of the Wildlife Refuge. Although our group will be arriving on the scene past the time of the great migration (a hit or miss proposition), we will still see small bands of caribou dotting the tundra. 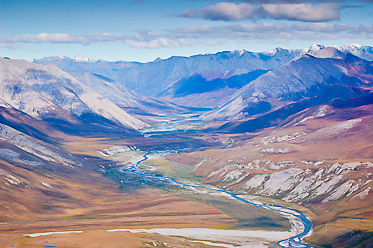 The Arctic National Wildlife Refuge lies in the most eastward and rugged part of the range. The mountain range is 150 miles wide and acts as the major barrier between the taiga (spruce) forests of the south and the treeless expanse of mountains, foothills and coastal plains to the north. 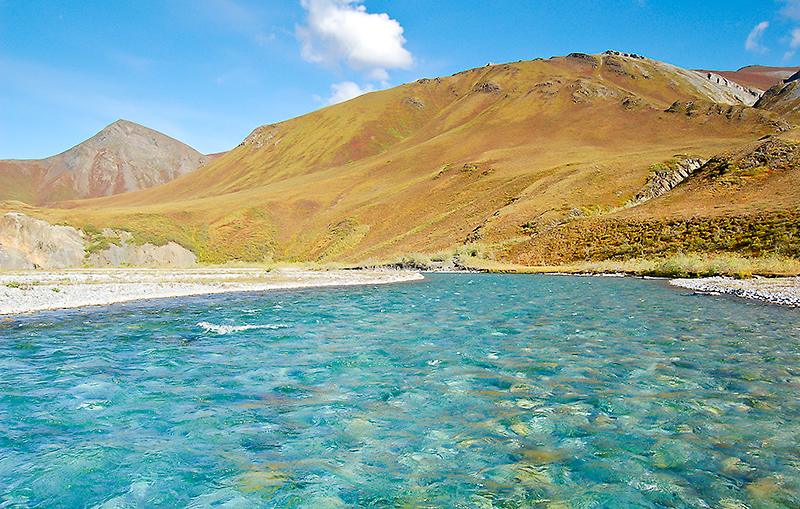 This is a land of bewitching beauty. Here, all creatures are present, the chorus is complete, the web of life hums, fully intact and in perfect balance. This land is North America's primordial heartbeat. Once there was a Serengeti West filled with the herds of buffalo of the Great Plains. Now, there is only the Arctic Serengeti, a place which resounds with the pounding of "wild hooves and the cries of wind and wolf, beating steady and true against the efforts to still it." "On a mud bar I passed a line of unusually large wolf tracks. Eventually they met and mingled with caribou tracks laid down about the same time. An encounter? What a free-ranging life for both wolf and caribou here! 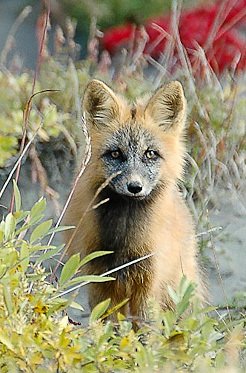 Both animals need broad stretches of wilderness to survive-as once did the bison and plains wolf of our long-lost frontier. I hope that man has the vision to keep his civilization from at least a few such wilderness as this-wilderness on the old, vast scale-so that wolf and caribou may continue to live as they always have; for their own sake, not ours. And if this wildness also can be an incidental reservoir for restoring man's spirit, then fine. But that is not the purpose of this place. Its purpose is to be. Man's role should be . . . let it be." Day in transit from hometown to Fairbanks. Overnight in hotel. In the AM we will fly to Arctic Village on charter flight. 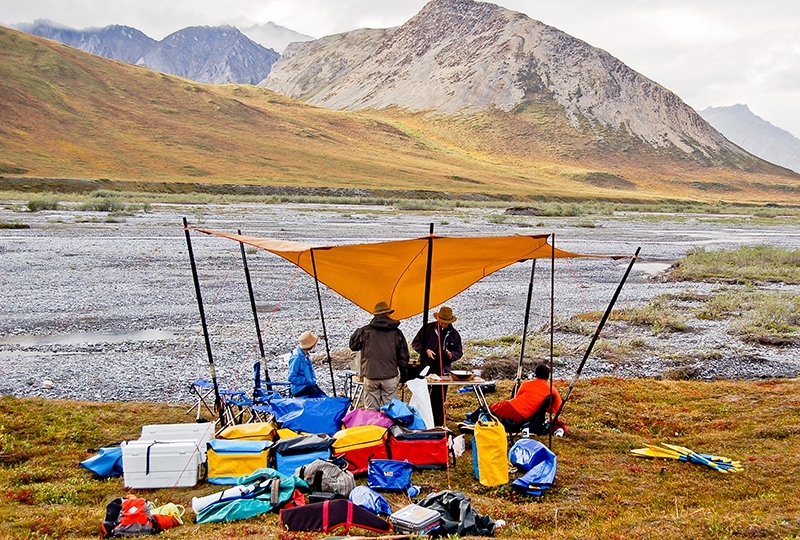 Once in Arctic Village, we will transfer our gear to our bush planes and fly over the Romanzof Mountains to the upper Marsh Fork of the Canning River. Our camp will be just North of the Arctic Divide. 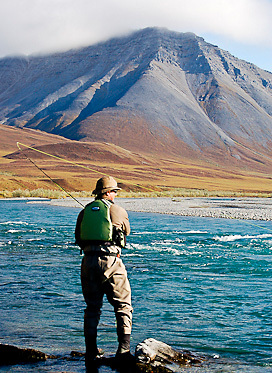 In the headwaters, we will spend time hiking, photographing, and fishing in an area of huge peaks, glaciers, and spectacular views before descending downstream. As we peer around us, we'll find that there is plenty of color to be discovered. Lichens are splashed against the rocks. Close to the earth miniature Japanese gardens of sweet pea, milk vetch, forget-me-nots, lupines, wooly louseworts, Lapland rosebay, anemones, saxifrage, bluebells, and asters-all spring into life during the short-lived summer. 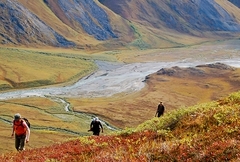 we enter the vast coastal plain replete with wildlife and multi-colored tundra. Since we have an abundance of light each day, our schedule will be leisurely and flexible. 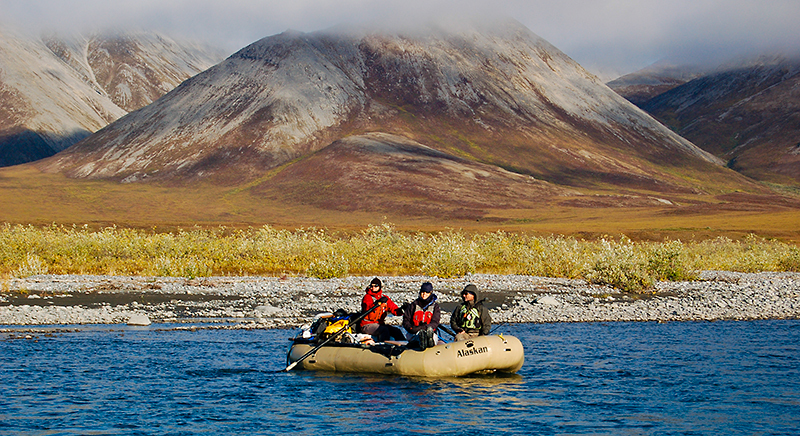 After paddling each day on this swift river, we'll take extraordinary rambles in search of the denizens of the landscape: the caribou, other Arctic mammals, birdlife, and wildflowers. The scenery is spectacular and the river valley provides countless possiblilites for hiking to the high ridges. 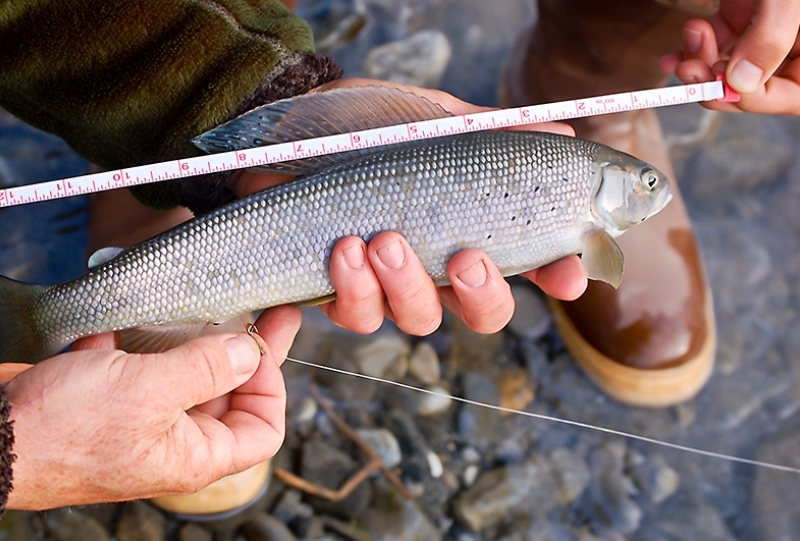 En route, we will have opportunities to fish for arctic char and grayling. Since one of our goals is the observation and photographing of wildlife, we will take advantage of our 1/2 day and full layover days to saunter over the landscape to avail ourselves of wildlife-viewing possibilities. The most exciting rapids are found in the upper reaches of the river including running a narrow gorge of Class III (intermediate) rapids. Our river journey ends only a few miles from the Arctic Ocean, at the last patch of tundra a plane can use as a landing strip. We'll either fly back to Arctic Village or directly back to Fairbanks. 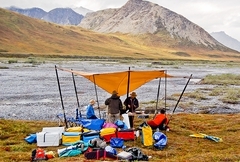 We'll return to our hotel then go out for a "no host dinner" to celebrate our successful expedition to the high Arctic. For a more comprehensive trip itinerary with images and additional information about this departure, please go to our Expanded Itinerary and Trip Details. 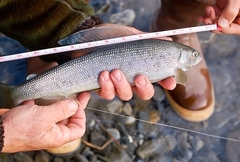 To read more about our Special-Interest Trips on this river, go to Marsh Fork of the Canning Special Trips. 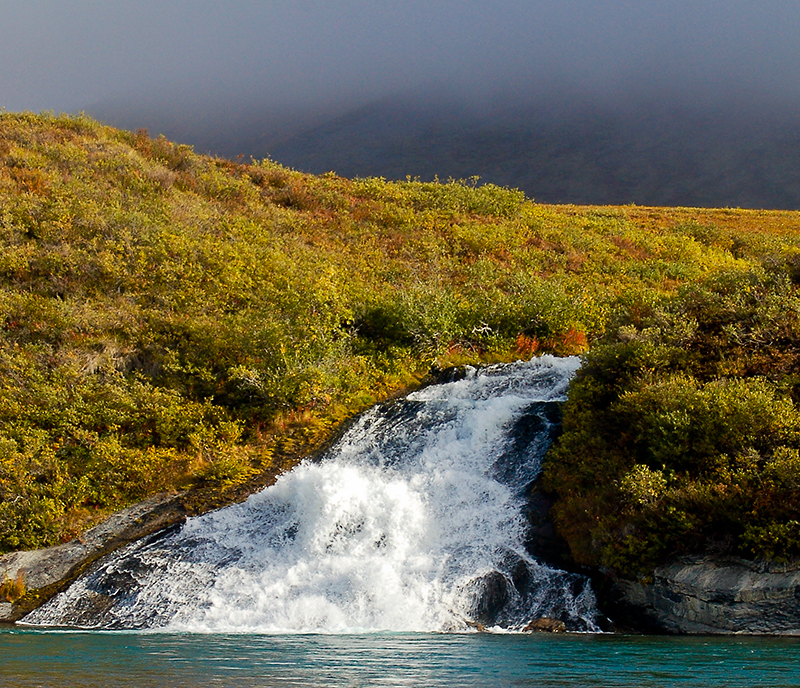 Arctic— Located less than fourteen hundred miles from the North Pole. 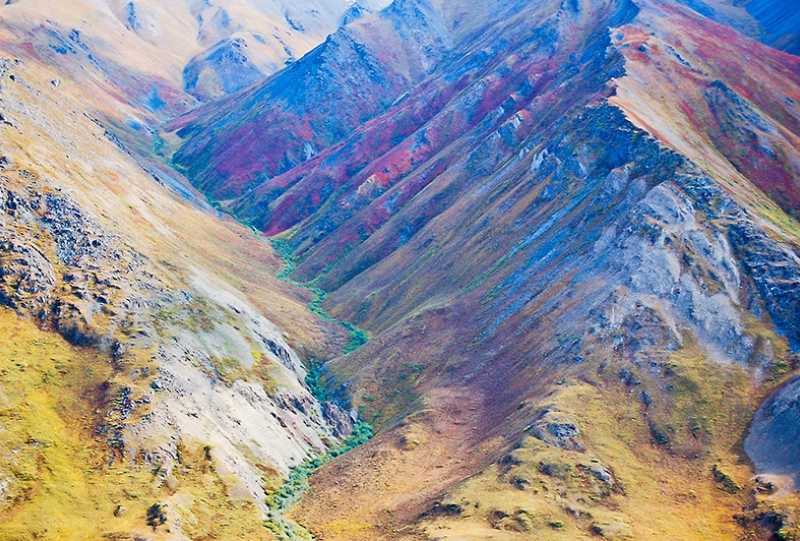 National— It's our land, not Chevron's or British Petroleum's, not even Alaska's. Wildlife— A stirring roll call: caribou, barren ground grizzly, wolverine, wolf, muskox, gyrfalcon, snowy owl, lesser snow goose, tundra swan. Refuge— Haven. A place for birds and animals from throughout the Western Hemisphere to call their own. 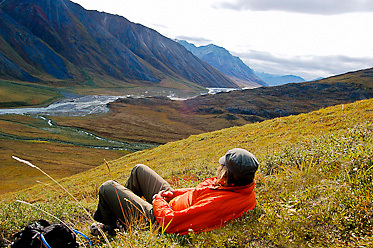 This trip is one for experiencing a remarkable wilderness area and storing the memories for protections's sake. The threat is a hunger for what fuels this modern age-oil. This is the time-worn story of oil versus wilderness. "But rarely have the lines of discord been drawn with greater exactitude, rarely have the stakes been so high, and never has conflict erupted in a landscape more powerful than the fragile magnificence that lies at the top of the world. The oil seekers would like to move east from Prudhoe Bay and punch a lot of holes and see what they can find beneath the tundra and the permafrost of the Coastal Plain. Conservationists, on the other hand, would like to keep those oil riggers and drillers out. 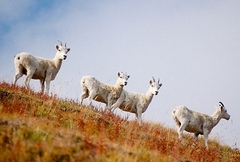 They think the Coastal Plain, like the mountains, is apart of a whole, unique and irreplaceable, essential to the natural coherence of one of the last great untouched ecosystems left anywhere on earth. They think that to tap into this place-even if the oil is there would be to damage it beyond redemption."